Bullbuster In Action: Bullbuster In Action: Live Lining Bait With 40 Lb Fluorocarbon. When the bite is steady but slow, and the fish are big but few, we turn to live bait fish with the hope of some monsters and a good time. We started off with cut bait and chum, the bite was heavy but slow. The guy on the corner in the stern of the boat (Ray) pulled in the biggest snapper of the night on his first hook up. This thing was a monster, so what did we do? We copied the guy catching all the big fish, live pilchards hopping on the elevator to the bottom all night. With a sabiki rig going next to us, it was a great night, every hit on a live bait was a heavy slam with a 10 second run afterwards. Luckily the sharks stayed away and we were able to fill the boat with dozens of monster mangrove snapper. One of the reasons we feel the snapper were biting so hard is because of the recent spawning. The spawning causes the bigger snapper to feed aggressively on large baits because they are trying to put weight on after laying eggs. You can see some of the snapper come up with pockets of empty flesh, where there used to be eggs. This empty pocket needs to be filled with something, why not whole pilchards, sardines, and ballyhoo a snapper diet courtesy of the Reward fishing fleet. If you enjoyed this article check out our recent articles below! The Stern drew first blood. Not a big surprise as a regular pulled up around a six pound mangrove. With only 10 minutes in the trip it looked like the starts of a nice night. As a couple other people on the stern reel in slob mangrove snapper, the bow started getting action to. Probably the bigger of the snapper from the night were actually from the bow. These grovers like checking structure out and a lot of times you can find them schooling by the anchor line. As the night went on and we moved to a second spot i started thinking how pleasant the trip was going with no fish stealing sharks. After another hour of constant snapper slaying i had an opportunity to get a live pilchard from a customer with a sebeki. The first drop and after five minutes BOOM. The biggest snapper of the night was caught. Just shows that live bait will weed out the smaller fish. When mate Bernie pulled anchor i realized i had a nice assorted bag of fish. Looks like it was another successful night on the Reward! Check out some more of our reports below! Yellow Tail Snapper started pouring in the boat as everybody around us started catching fish as fast as they could get the hooks in the water. Bullbuster Mono on the reel and a Circle hook ready with chopped bait was doing the trick. We all limited out, and gave some fish to the people who did not. The best part of the trip is watching the shore line as you coast in on a warm summer night with a cooler full of fish and bait smell on your hands. If you are looking for a great time, and relaxing boat ride, some fresh fish, and a 4 hour fishing trip all in one, you found it here. 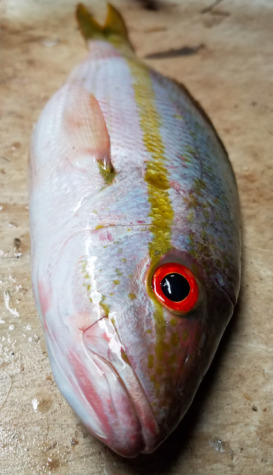 "First cast using a chunk of Ballyhoo, YellowTail"
When we arrived to our first location the wind was blowing out of the south east and the current was running north. We decided to drop anchor and try our luck... First cast using a chunk of Ballyhoo, YellowTail.... not what we came for this time but never a bad sight. Marked it 3 in the head and threw it in the cooler, thank you Bernie. We tossed our baits back and my friend and I are doubled up on huge Mangrove snapper, SHARK! Here comes the tax man, right on time we both get taxed. Eager to get back in the water, I almost hook myself in the hand baiting a tail of ballyhoo. We send one cast far and one close to the boat, FISH ON! Now we are pulling these snapper up to the boat as fast as possible to avoid the sharks, which is a rush in the moment, and seeing the sharks chase the fish all the way in gets your hands moving pretty quick.